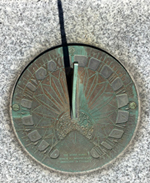 This 6 x 6 ft. bronze, vertical sundial faces directly south on the curved sandstone wall of the Observatory. This dial was fabricated of Muntz metal bronze that received a hot applied green patina to compliment the brown sandstone color of this 1916 university observatory. Because of its large size, the metal dial weighs 650 lb. The hour numbers and lines are raised and applied to the surface of the dial. The Roman hour numbers that surround the dial plate in a frame take their shape according to the hour angle. Declination lines of the solstices and equinox are marked by the triangular gnomon shadow tip. The dial includes a built in longitude correction to show solar time for the time zone meridian. On a nearby wall below the dial, a plaque features an analemmatic graph for the equation of time correction to get clock civil time. 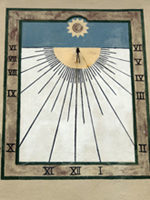 The sundial is attributed to Vincentian Brother Angelo Oliva, being painted sometime in the 14 year period between 1823, when he arrived in Perryville to lead the reconstruction of the original, wooden church into the present one made of stone, and 1837 when he died. The dial has been recently repainted. The vertical dial is incorporated into a bright, flowing mural 29 x 54 feet covering nearly all of the south wall of a brick building. The mural was several years in the making. It began with an international competition sponsored by Allied Arts of Bellingham and sundial enthusiast Sasch Stephens. 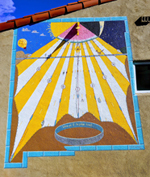 Ultimately the mural with embedded vertical dial was dedicated on the fall equinox. Called the "First Shadow Celebration" many local celebrities recognized the new mural artwork and old art of sun dialing. On the boardwalk, inset into the wood planks is a smooth concrete walkway about 12 inches wide. Months and instructions are given in neat lettering made in the concrete. The hours are done on a half-ellipse using the same smooth concrete, Arabic numbers, and 15-minute time marks (far narrower than a person's shadow). The dial is set for daylight saving time (with no longitude correction). The John Myers monumental sundial is truly a masterpiece in time. The 11 foot tall black granite gnomon seems to grow out of a larger granite block. Time is marked by the several rows of low, large flat stones, 25 in all. They are set for summer solstice (first row), equinox (second row that has the stones all in a liner), and winter solstice (only for 10am-2pm. The stones themselves are too large for precise time telling, but the use of colored dots painted on the stones allows you to tell exact civil time using the tip of the sundial's shadow on the solstices and equinox. This bronze dial is about 14 inches in diameter with a coarse near-white patina. Time is delineated in 5 minute intervals from 4:30am to 5:30pm. The hours are marked in Roman numerals and includes a gnomon gap for a fairly thick gnomon. The dial sits on on square stone pillar and thick plinth. Measurement of the gnomon angle agrees with with latitude engraved on the dial plate of 40° 25' that is more than a degree off the latitude of the the dial site. Sewickley is a borough in Allegheny County, Pennsylvania, 12 miles (19 km) west northwest of Pittsburgh along the Ohio River. Riverpark was created in 2010 with a meandering path. 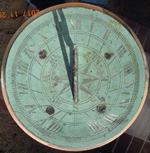 At one stop is a plain analemmatic sundial approximately 15 feet across on a gravel bed. Hour markers are granite stones showing 4am-8pm. The analemmatic walkway has engraved abbreviations of the months, looking like granite blocks, but actually clever and beautiful concrete. The memorial is positioned and shaped to capture sunlight through its vertical spaces. While the sun travels the horizon, columns of light shine onto the ground, highlighting words engraved in the stone below that express individual and shared experiences about the war. This bronze dial is about 12 inches in diameter. The outside chapter ring is delineated in 15 minute intervals with hours shown in Roman numerals from 4am-8pm. The gnomon has the profile of a bird under the style. An hour glass and wings on the dial face symbolize "Time Flies". This patina dial shows lots of wear. Although it sits on an elegant helical pedestal. The dial has a compass rose and from measurements of both the dial and gnomon, it was constructed for London at 51 degrees. This is further supported by the hour extent from 4am to 8pm. The hours are delineated in irregular 5 minute marks with hours shown as Roman numerals. The 6am to 6pm hour lines should be exactly opposite, but are angled toward the gnomon foot. Unfortunately this dial never kept good time in London and certainly can not tell accurate time in Pennsylvania. The sun dial was given to the college in 1909 by the Class of '99 as a memorial on their tenth anniversary. It consists of an elegant bronze dial showing time from 6am-6pm delineated in 15 minute increments. Hours are shown in Roman numerals. The gnomon has the number "99" beneath the style. 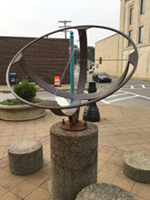 The dial is mounted on a granite pedestal forty inches in height.